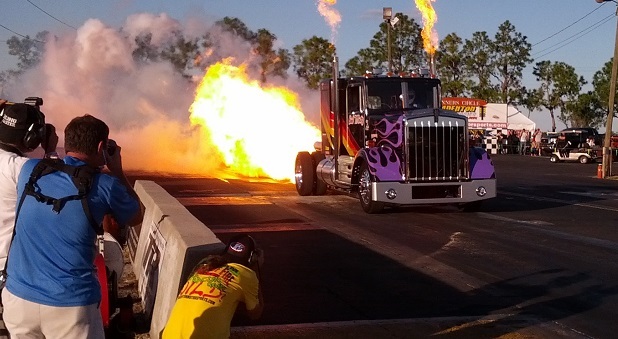 Bob Motz puts on his awesome fire show. New York can have its gleaming ball drop on New Year’s Eve. 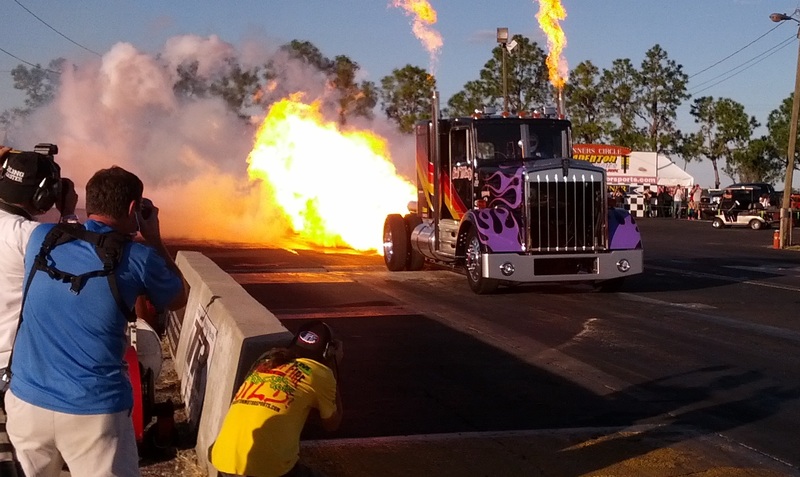 I’d much rather send out the old year with the Snowbird Outlaw Nationals’ Jet Jam Night of Fire at Florida’s Bradenton Motorsports Park. This year’s event was jam-packed with good friends, lots of fire and a whole lot of fun. The 2013 Jet Jam featured a fantastic line-up: Larsen Motorsports raced two jet dragsters driven by co-owner Elaine Larsen and new driver Dawn Purdue; and The Wicked Willy jet funny car driven by Jerry McCart faced off against Sam Ives in the Heat Wave funny car. 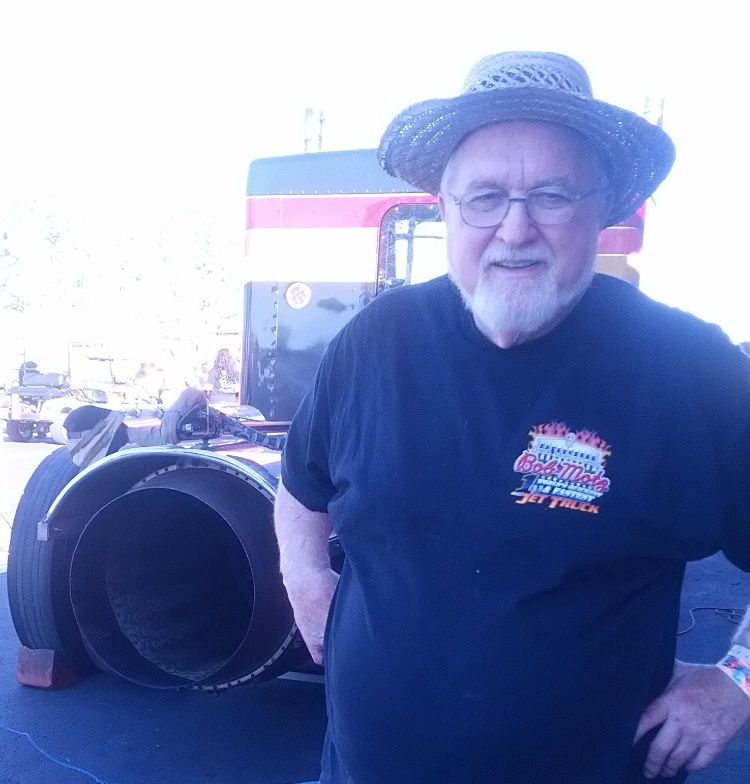 Last, but certainly not least, the one and only Bob Motz and his fire breathing, rockin’ & rollin’ Original Jet Truck put the icing on the cake. It was a beautiful day and night and the jets looked and sounded great on both runs. The crowd was wowed and the drivers all made it down the track safely and back to their pits to sign hero cards, shirts and even one young man’s helmet. Next to the runs themselves, I can’t think of anything I enjoy more than watching people come and talk to jet drivers after they race. There were oodles of little girls dancing around the Larsen Motorsports’ pit area waving their hero cards. 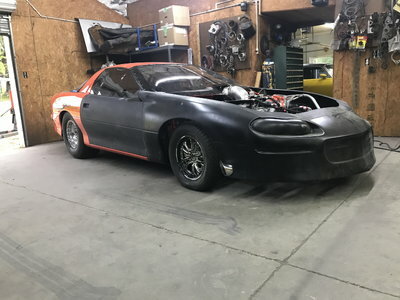 They are a perennial testimony to the inspiration that Elaine and her team provide to women of all ages since Elaine began racing jet dragsters ten years ago. In 2014, Larsen Motorsports is fielding the first ever team of four female jet dragster drivers. Over at the Original Jet Truck’s pit, wide-eyed, still-looking-for-words, kids and adults gushed their breathless thank yous to Bob. He sat on the stairs of his rig signing shirts and answering the questions he has heard since he and son Scott built the truck and brought a whole new world of excitement to jet racing. The 1998 Kenworth weighs 7,000 lbs. and is powered by a J79 General Electric jet engine that is otherwise used to get B-58 Bomber or F4 Phantom Fighter jets off the ground. Elaine wasn’t even supposed to race, but driver Marisha Falk, was snowbound in Texas and unable to get a flight. The race must go on, so Elaine changed her plans to be in Orlando to unveil the new “Blaze” comic book about her life as a jet racer. She unveiled it at Bradenton, instead, along with the comic’s artist, Mark Enkerud of St. Petersburg, FL. The first edition of the comic book was on sale at Elaine’s merch truck and it really looks amazing. For more information on how the comic book was created, or to order a copy go to www.adventuresofblaze.com. 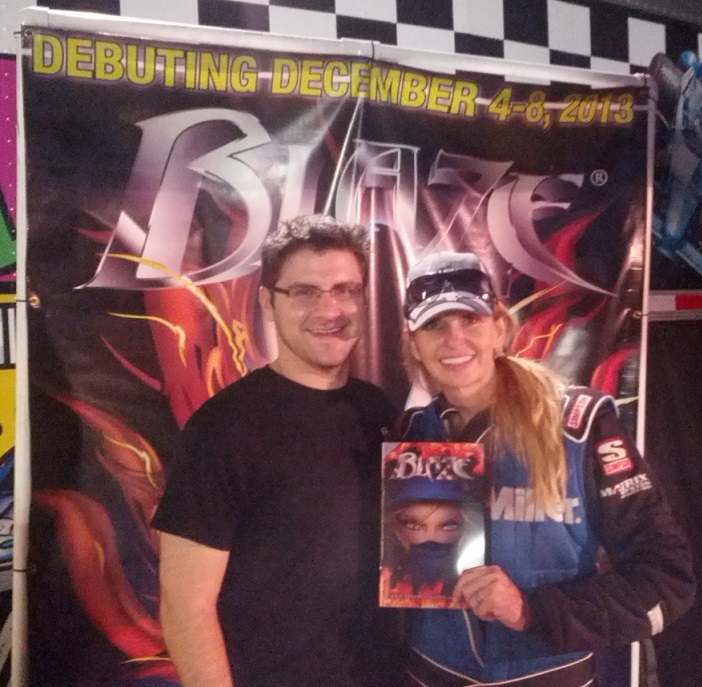 Elaine Larsen and Mark Enkerud pose with the “Blaze” comic book. Dawn’s two trips down the track were her official debut with Larsen Motorsports. The 27-year-old pediatric nurse, who comes from a racing family, had previously driven jet cars in the Northeastern U.S. Thrilled to be joining the Larsen’s team, Dawn said she was first inspired by to get behind the wheel by Jessie Queen of Diamonds, who wowed the jet circuit in mid-2000s. Also in the pits was 19-year-old Kat Moller who rounds out the team. She also is from a racing family and began driving junior dragsters at age 11. Elaine Larsen (Left) and Dawn Purdue. 2014 is going to be another big year for Chris and Elaine Larsen who have achieved their dream of bringing jet car racing to the next level. But with those two, there is always another level to reach for, so stay tuned. I’ll never forget seeing Bob Motz’ fabulous jet truck for the first time in Orlando in 2003. When the truck started rocking back and forth as he almost burned down the brick wall behind the starting line down, I fell head over heels for the whole package. Bob Motz smiles for the camera. Needless to say, I was dumbstruck when news reached me about his accident in June of 2007 at Kanawha Valley Dragway. 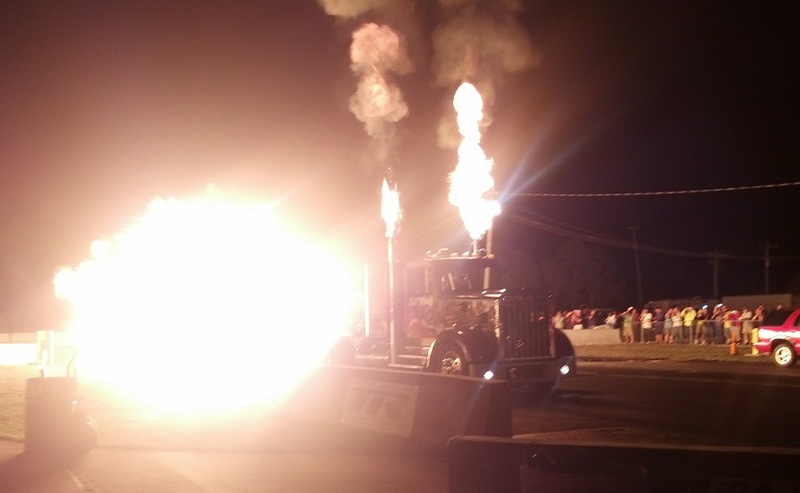 The cab of Bob’s truck became engulfed in flames near the starting line, but he got out and was airlifted to the hospital with second and third degree burns. Despite his lengthy and difficult recovery, Bob and his son Scott fixed the truck and got back on the road in 2009. It’s difficult to imagine the guts it must have taken for him to get back on the track. Apparently 40+ years of jet racing is a very strong force. I savored the two incredible fiery runs that Bob made at Bradenton. Taking pictures of the fire show isn’t easy because I’m usually shaking and laughing with glee the whole time it’s going on. I get the photos I need and then brace myself against the light pole to watch the truck blast off the line. I usually get the ETs, but this weekend I was just too in the moment to think about them. Let’s just say everybody was good and fast! I think the best illustration of the raw power, is at the end, when the guy standing down track form me is nearly knocked off his feet by the wake form the truck. the billowing shirt is pretty awesome to. Pretty good show. How on earth does he get the truck to rock like that? Jet engines make no torque, just thrust which is a straight line force. Gotta admit that thing does launch smartly. J79 in full burner must make upwards of 20,000 lbs of thrust. Pushing a 7,000 lb rig makes a pretty good thrust to weight ratio. What’s the trap speed?